After thousands of Ellipse miniature inertial sensors operational on the field, SBG Systems proves again its capability of continuous innovation. With major improvements, the Ellipse line of miniature inertial sensors strengthens its position as “best combination of innovation, performance, and reliability” while keeping the same form factor and price level. With low noise gyroscopes and new high performance accelerometers providing superior noise level, the accuracy of every Ellipse models has now improved from 0.2° to 0.1° in roll and pitch. In addition, the new accelerometers tolerate very high vibration environments (up to 8g). The Ellipse-N model is an all-in-one inertial sensor that embeds a L1 GNSS receiver. Ellipse-N is already compatible with GPS, GLONASS and BEIDOU constellations. With the addition of GALILEO tracking, Ellipse-N benefits from more satellites, improving the signal robustness in harsh environments. Ellipse embeds high quality sensors with a greatly improved long-term stability. Sensors are totally integrated in an IP68 enclosure, resistant to dust and water. Every Ellipse sensor is tested and calibrated in temperature and dynamics, to ensure constant behavior in every condition. Highly robust, Ellipse are guaranteed for 2 years. This warranty can be now extended up to 5 years. Thanks to a fully backward compatibility design, the new Ellipse series can be used as a drop-in replacement of the previous Ellipse. No specific action is required in terms of mechanical, electrical or software integration. New Ellipse sensors are available for ordering. Contact your representative to get more information. 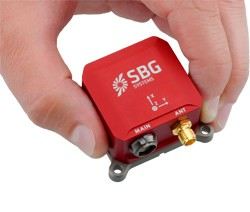 SBG Systems is a leading supplier of MEMS-based inertial motion sensing solutions. The company provides a wide range of inertial solutions from miniature to high accuracy. Combined with cutting-edge calibration techniques and advanced embedded algorithms, SBG Systems products are ideal solutions for industrial & research projects such as unmanned vehicle control, surveying applications, antenna tracking, and camera stabilization.